42Floors, the Y-Combinator-incubated startup that has built a search engine for the office rentals market, has raised another $12.3 million — funding that founder Jason Freedman says the company will use to take its service to markets outside of San Francisco and New York, including its first international move to London by the end of this year. The Series B round was led by new investor NEA, with participation from existing backers Bessemer Venture Partners and Thrive Capital, as well as new investor Columbus Nova Technology Partners. To date the company has raised $17.7 million, with the Series A round of $5 million only announced in November 2012 — although it had closed months before that. Since launching a year ago, 42Floors says that it has connected some 1,000 businesses with over 2 million square feet of office space. A lot of that work so far has been catering to world of startups of which 42Floors itself is a part, companies that, in his words, “just assumed there were solutions like 42Floors already in the market, when there were not.” The move to more cities in the U.S. speaks both to how the startup world is growing up in markets outside of SF and NYC, and also how 42Floors has over the year expanded its profile to cater to other segments of the business world. 42Floors is another example of that trend in startups — typified also by companies like Airbnb or Uber — that apply Silicon Valley-style tech innovation to non-tech problems. It’s a paradigm celebrated by the likes of David Sacks, founder of Yammer; and Paul Graham of Y Combinator. In this case, the commercial real estate world already had channels for marketing rental properties both online and offline. Believe it or not, engaging sites and efficient search engines were not the norm before with online commercial rental listings — Freedman should know, because he went through the process of taking courses to become a broker himself to get to know the market well. That has left 42Floors with a window of opportunity. “We believe if we deliver ten times better user experience, it should sufficiently differentiate 42Floors against alternatives well, especially in the eyes of prospective office managers,” notes Paul Hsiao, a partner at NEA who is now a part of 42Floors’ board. Another part of the attraction has also been the business model behind 42Floors. Brokers and landords pay no listing or data usage fees on the site, and a good part of 42Floors’ revenues instead comes from services wrapped around the core business of listings. These include affiliate fees on ecommerce — providing links to, say, companies that rent or sell office furniture. And further down the line Freedman also says that they will include more services on the sell side, such as creating profiles for different companies to help market their property portfolios better. There is also an API in the works — although Freedman says that the company is still contemplating how this will be implemented. As with all API plays, this is another route that 42Floors could use to scale up its exposure and size. You could envision it working, for example, on real estate owners’ own sites, or on the sites of the companies where other office products are sold, as well as potentially in apps that are providing location-aware information on a wider scale — Urban Compass, which shares an investor with 42Floors (Thrive and the Kushners), is one that comes to mind. He says that some 80% of searches on the site at the moment are coming for cities outside of San Francisco and New York. 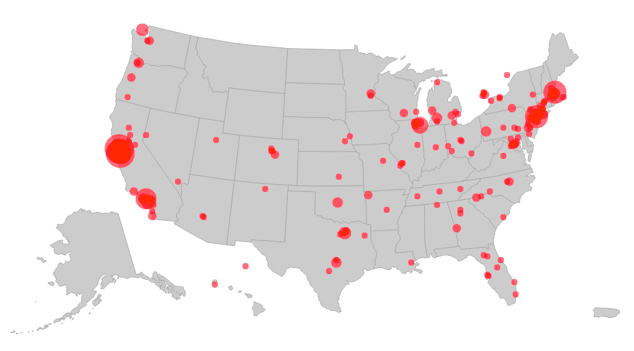 Judging from the size of the red spots, it looks like LA, Chicago and Boston may be next up, since there are already people in these markets who are searching for space on 42Floors, and many of 42Floors’ existing partners among property owners and landlords have operations that extend beyond New York and San Francisco. The London project, meanwhile, is longer term and is being advocated strongly by the London officials that want to help increase the city’s business profile particularly among tech companies. Professional photographers, national and international launches, and ramping up the tech quotient on 42Floors all sound like a lot of work and investment for a company that today only has around 10 employees and still has the ethos of a startup itself. But interestingly, Hsiao notes that when NEA came along for a Series B, 42Floors wasn’t looking to raise capital. “We proactively connected with them because we have this thesis around searching for and investing in platforms with beautiful design, stunning visual search experience, and empowering professionals/craftsman in the trade,” said Hsiao.